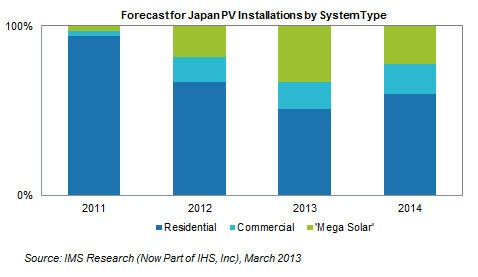 iSuppli reports Japanese photovoltaic (PV) market is set to grow by 120 percent in 2013 and install more than 5 gigawatts (GW) of new capacity. Installations expected to exceed 1 GW in the first quarter alone, causing it to become the second largest market in 2013, analyses iSuppli. Japan’s PV market currently benefits from a feed-in tariff (FIT) paying up to ¥42 per kilowatt hour, even though this is likely to be reduced by approximately 10 percent beginning April 1. “At ¥42 Japan’s FIT is by far the most attractive globally—overly generous perhaps, which could lead to overheating of the market,” explained Ash Sharma, senior director of solar research at IHS. The report reveals that installations are estimated at over 1 GW in the first quarter of 2013—the final quarter of Japan’s fiscal year—and forecast to exceed 5 GW for the whole of 2013. This would see Japan leapfrog ahead of Germany, Italy, and the U.S. to become the world’s second largest PV market. IHS research found that domestic PV installations are proving to be a lifeline for struggling Japanese companies that are able to sell both modules and inverters at high margins, despite their competitiveness at an international level falling behind their overseas peers. Providers of residential ‘system kits,’ EPCs and project developers are also seemingly enjoying the high margins that come with a generous FIT and its resulting high system prices. “Residential system prices in Japan are roughly double than those installed in Germany. The ability to sell modules and inverters at significant premium compared to the rest of the world, coupled with high demand and growth, provides a much-needed profit stream for Japanese suppliers,” commented Frank Xie, report co-author and IHS senior analyst for PV and solar research. Although Japan has been reportedly attempting to attract foreign PV companies to its shores in order to help accelerate supply—and hence, installations—the report found that it remains a tough market for non-Japanese companies in which to compete. “While many Chinese and even U.S. module suppliers are now serving the Japanese market, they remain the minority and have largely needed to resort to OEM agreements and partnerships with Japanese manufacturers, despite being highly regarded brands in the rest of the world. Simply put, Japanese customers want to buy Japanese modules. Non-Japanese inverter companies have found it even harder to serve this market as tough regulations from the certification board—JET—and even more stringent requirements from utilities have meant that substantial product redesigns are required before they are able to target this market effectively. As a result, the market is currently suffering from a bottleneck in inverter supply,” observed Sharma. Mega Demand for ‘Mega Solar’ – But for How Long? Projects more than 2 megawatts in size—or ‘mega solar’—in Japan are a major driving force behind the country’s triple-digit growth rate, but this is expected to be short-lived, according to the report, and the projects will face a decline after 2013.